Surveying the current market, you could be forgiven for thinking that Palestrina and Victoria shared a monopoly on liturgical music in the late 16th century. The quality of the music on this disc demonstrates how reductive that assumption is. Perhaps we shouldn’t lament the fact too much though; this is good but Palestrina is in a different league. Rogier, one of many Flemish composers in the Spanish court of the late Renaissance, wrote proficient and elegant music. Those of you with a choral upbringing may know him from the motet Laboravi in gemitu meo, which is included on the disc. There is a frustrating paradox with this music. 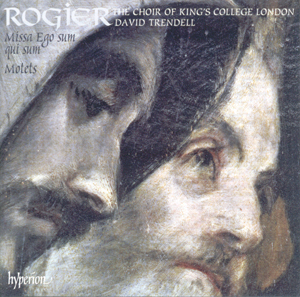 It is clearly the work of a composer with a distinctive voice, yet that distinction does not prevent most the tracks on this disc, and the mass that makes up its greatest part – Missa Ego sum qui sum – suffering from that evenness of tone and pace that can reduce so much Renaissance choral music to only mildly engaging continuum. It is a parody mass, based on a motet by Nicolas Gombert (why isn’t that included?) and it inherits a certain harmonic adventurousness from the work of that great predecessor. Rhythm is the mass’ great distinguishing feature, and in particular the way that distinctive rhythms are used to articulate the counterpoint. The choir (more on them presently) go to great lengths to articulate these rhythmic elements, be they characteristic incipits or what conductor David Trendell describes in his liner notes as spiralling descending sequences at the cadences. I take issue with his claim that this is one of the finest mass settings of the late 16th century, but the way in which these relatively simple rhythmic ideas are used to clarify the contrapuntal texture stands it out from the crowd. Six motets are interspersed amongst the movements of the mass, including the Laboravi mentioned above. The mood in these tends to be calmer, but the harmony is often more adventurous. The opening of Caligaverunt oculi mei, for example, is intriguingly ambiguous, with the successive entries of each of the voices suggesting competing modalities. Common ground is found soon enough, of course, but that implied harmonic tension remains. And again that Renaissance wall-of-sound that makes up the surface of the motet remains throughout at odds with this underlying ambiguity. Another interesting feature of the first and last motets is the accompaniment from the English Cornett and Sackbut Ensemble and a lute in the final track. The main beneficiary is again the rhythmic profile of the music, with the cleanly articulated lines elegantly highlighted by the early brass. The Choir of King’s College London is a fairly large choir made up of choral scholars from the college and this is their first collaboration with Hyperion. Comparisons with their Cambridge namesakes would be unfair, and the use of women’s voices in particular makes it more or less irrelevant. Even so, it is only through comparisons with very best that their ensemble and tuning are found wanting. This is choral singing to a professional standard, and the choir makes light work of Rogier’s adventurous harmonies. As I mentioned, their articulation of the rhythms is impeccable, and their clear and unified sense of phrasing is expressed through subtle and wholly appropriate dynamic gradation. All in all, this sounds like a promising start to a collaboration between a choir worth hearing more of and a record label with an excellent track record of promoting such ensembles. Let’s hope they remain as adventurous with their repertoire in future releases.